So why do we forward tasks to tomorrow, when tomorrow’s not going to make them any easier, and might make them even worse? We procrastinate to avoid doing something we find boring, frustrating, uncomfortable, difficult, not fun enough. And here’s the crux of it – the immediate pain doesn’t feel worth the eventual gain. But no matter why we procrastinate, the hardest part is taking the first step. The reason to-do lists don’t work and New Year’s resolutions fail is because they’re too abstract. If you’re putting off finding a job you love, filing your taxes, exercising regularly, getting your email in-box to zero, writing a blog post about procrastination, it’s probably because the first step to completion isn’t clear and actionable. When I was forwarding “writing a blog post” from one weekly to-do list to the next and not inching any closer to the finish line, I’d forgotten to follow the most basic Coaching technique that I use with my clients. Break goals or tasks into small, reasonable, achievable parts. If you want to tackle procrastination, try this for step one: create bullet points with a few small, achievable items that it will take to get the job done. When you find yourself stalling out on a chore because it’s boring, frustrating, uncomfortable, difficult or just not fun enough, make a list of 4 benefits that will come from completion. And then add benefit #5, “celebrate the win.” This is always important. Take a moment to breathe in the achievement, before moving on to your next to-do. Accountability is one of the fundamental tools that I use with Coaching clients. And I use it because it works. Let’s say you want to tackle procrastination for a project and you’re willing to take on Steps 1 and 2. 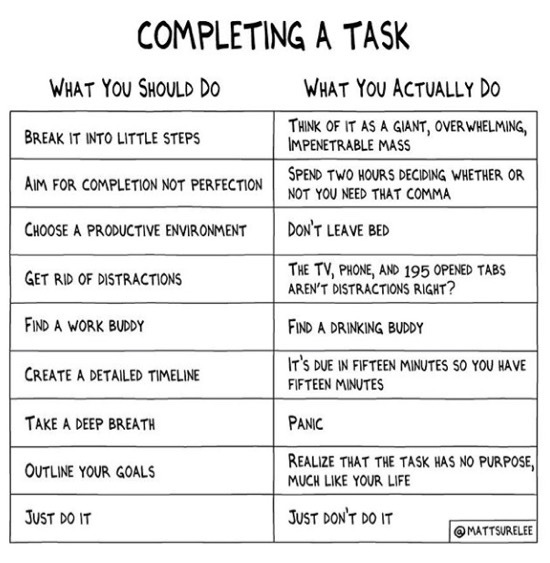 Astutely illustrated in the above chart by Matt Shirley – JUST DO IT! And if you’d like personalized accountability and career guidance that gets results, please get in touch.